Quincy Delight Jones, Jr. was born in Chicago’s South Side on March 14, 1933 but grew up in Bremerton and Seattle, Washington. While in elementary school Jones picked up the trumpet, and his skill with the instrument led him to receive a scholarship to Berklee College of Music. However, he dropped out of Berklee after he was given an offer to go on the road with bandleader Lionel Hampton. After his time with Hampton, Jones began work as a freelance arranger. He also traveled the world with the Dizzy Gillespie band as well as Harold Allen’s jazz musical Free and Easy. Jones then settled in New York and went to work for Mercury Records. Jones advanced at Mercury and in 1964 he became the first African American to hold the position of vice president of a white-owned record company. During the 1960s and 1970s Jones worked as a social activist, supporting such programs as Dr. Martin Luther King, Jr.’s Operation Breadbasket in Chicago. He also joined the board of Rev. Jesse Jackson’s People United to Save Humanity (PUSH). Jones also helped form the Institute for Black American Music in an effort to bring more appreciation to African American music and culture. 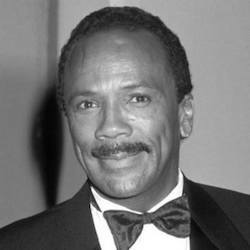 Quincy Jones’s music career has led him to work on various projects ranging from Michael Jackson’s record-selling 1984 album Thriller to the theme songs for Sanford and Son and The Cosby Show. Jones, however, refused to confine himself to music alone. He has also worked as a producer in film and television. He remains co-CEO and chairman of Quincy Jones/David Salzman Entertainment. Throughout his illustrious career as a performer, arranger, producer, director Jones has accumulated countless awards, and has become the most nominated Grammy artist ever with more than seventy nominations. He has won twenty six Grammies.